This is the Minimum Tensile Strength determined by ISO. If a roller chain fails a tensile load below this value, it does not surpass the standards. This is a minimum value determined by statistical processes at Tsubaki. 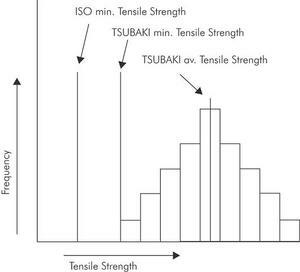 If a roller chain fractures at a tensile load below this value, it does not surpass Tsubaki standards. Tsubaki standards are higher than ISO standards. This is a fracture load reading obtained after a long period of actual tensile strength testing of a large number of chain strands. Of course, when any given strand of roller chain fractures, this value may be higher or lower, so it does not represent a guaranteed value. 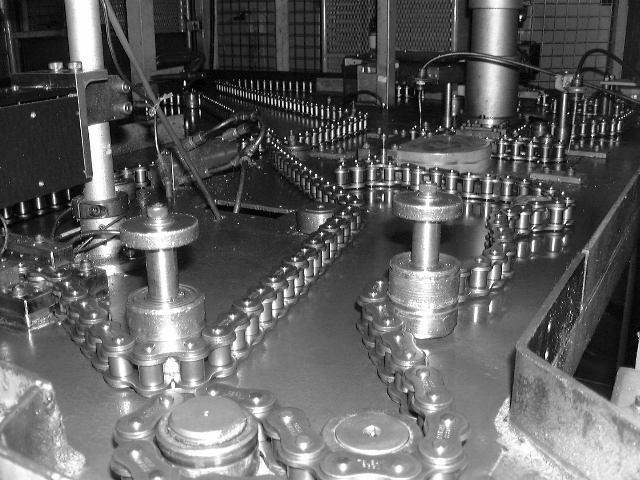 As shown in below, a roller chain with minimum of five links is fixed at both ends by clevises and tensioned until fracture occurs. 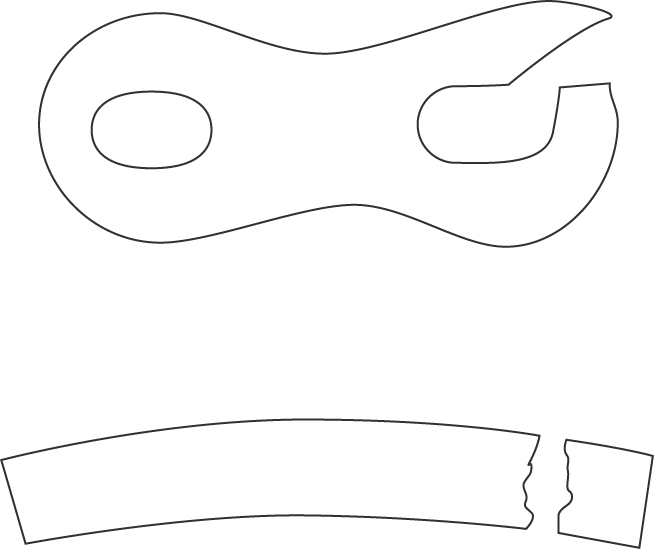 The type of fracture can be used to determine the cause of the breakage of the chain. The Maximum Allowable Load (M.A.L.) of a roller chain (excluding Stainless Steel Chain and Engineering Plastic Chain) is the value derived from the lowest fatigue limit. When a load lower than this value is repetitively applied to the roller chain, fatigue failure will never occur. The Tsubaki M.A.L. is determined after 10 million repetitive loads instead of 3 million repetitive loads which is the European Standard. The Maximum Allowable Load of Stainless Steel Chain and Engineering Plastic Chain is determined by the surface pressure between the pins and bushes. 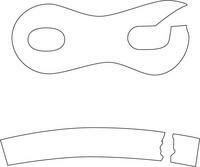 For easy assembling the pin and link plate of a connecting link are slip fit. In general, this type of connecting link has a 20% lower fatigue strength than the chain itself. However, Tsubaki developed a special process to eliminate that loss of fatigue strength and still satisfy the customers demand for easy assembling: the patented Ring Coining process. By applying the patented Ring Coining process, Tsubaki generates a cold deformation around the pin hole of the connecting link plate. This results in residual stress around the pin hole and thereby adds strength. By using this process, transmission capacity is increased back to 100%. Tsubaki applies the patented Ring Coining process to all slip fit connecting links. For severe conditions, Tsubaki has developed the Heavy Duty Chain series. These chains are standard equipped with press fit connecting links. The installation is more difficult than in case of standard connecting links. 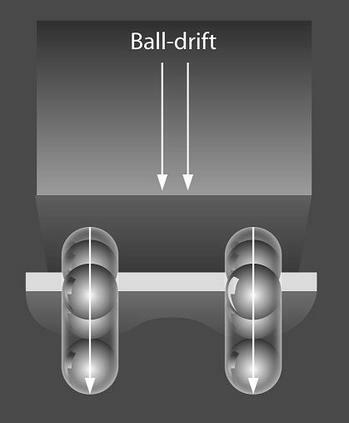 Ball drifting is the process of pressing a hardened steel ball through a hole in an already hardened steel plate. The goal of this process is to create local plastic deformation and effectively add compressive stress to the walls of the hole. 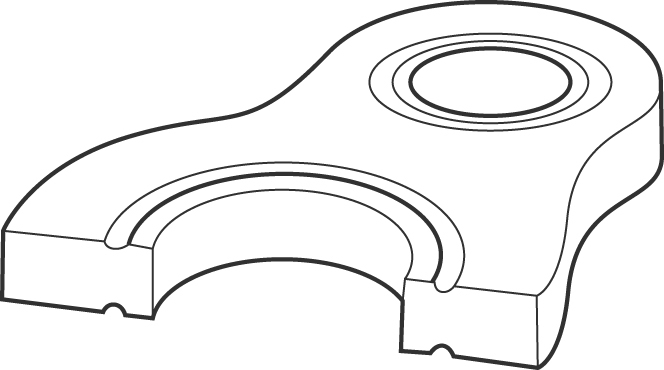 Besides this, the process generates precisely controlled holes for an optimum press fit. Together, this leads to significantly improved fatigue life (up to 30%). 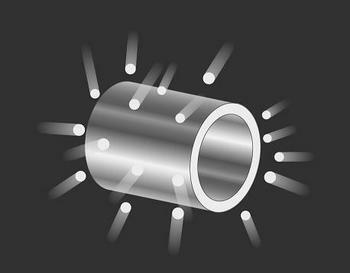 Shot peening is a process used to produce a compressive residual stress layer and modify mechanical properties of metals. It means impacting a surface with shot (round metallic or ceramic particles) with force sufficient to create plastic deformation. At Tsubaki, all basic chain parts (except pins) are shot peened. After the assembly of a chain, Tsubaki always applies an initial load, which is called a pre-load. The pre-load force approximates the recommended Maximum Allowable Load and is applied to seat the various chain components such as pins, bushes and link plates. The benefit of pre-loading is that it minimizes the initial elongation. Minimization of this initial elongation increases the chains service life therefore pre-loading is very important.